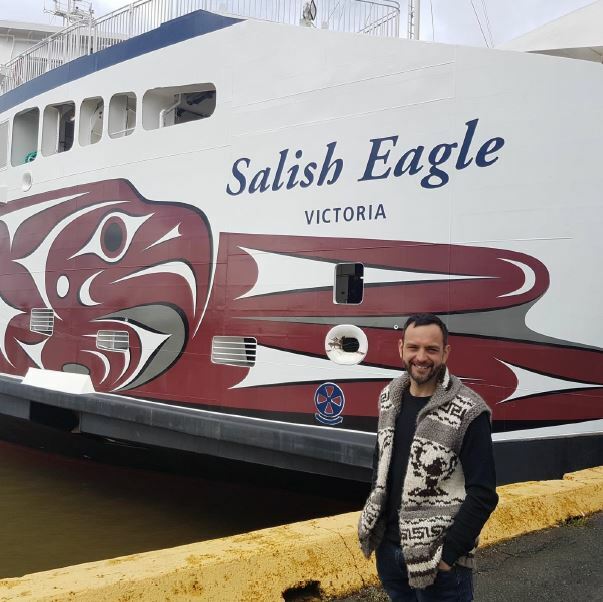 Thursday at BC Ferries’ Richmond refit facility, the wrap adorning the hull of Salish Eagle was unveiled to Stz’uminus First Nation’s John Marston, who designed the artwork that was revealed last September. April 13, 2017 - Stz’uminus First Nation’s John Marston sees his artistic design up close on the hull of Salish Eagle for the first time. Coast Salish artist John Marston’s bold depiction of beautiful red eagles adorning the hull of the new vessel represents the strength and respect the eagle carries in First Nations culture. Marston’s work is strongly influenced by his ancestors and their masterpieces. Salish Eagle will enter service on the Tsawwassen – Southern Gulf Islands route at the end of June. The vessel recently completed a 10,440 nautical mile journey from Gdansk, Poland. It features two car decks and has a service speed of 15.5 knots, powered by three dual-fuel Wartsila 8L20DF engines.